The REVEAL is here and I am SO happy to be finished and sharing it with you! This has been an emotional makeover for sure. Trying to makeover a room, when really nothing was wrong with it, has been trying to say the least. 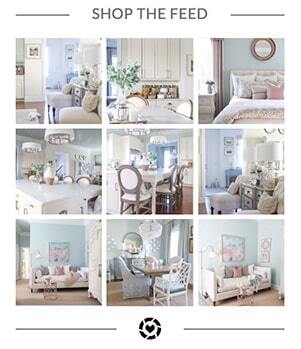 Make a pretty room even prettier and coordinate with the ENTIRE downstairs? 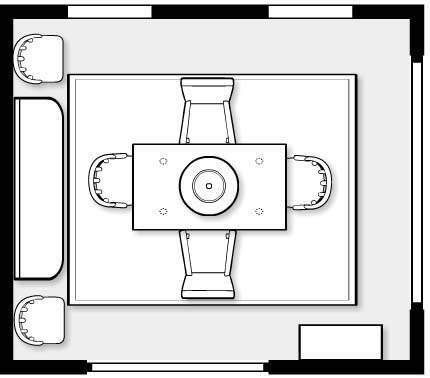 No pressure…here is the room “before” and the planned changes. Unconventional because I am not using the upholstered chairs at the end of the table, but in the middle. Plus I replaced a FOREVER dying plant in the corner with a much better option – a BAR CART! 2.5 mirrors, which rounds up to 3! Luckily, I financially recovered most of my loses and found new ways to sell things when I decide to redecorate another room. Plus I had no idea how much I loved making floral arrangements! Another creative outlet – YES. Just because something is brand new doesn’t mean you can’t modify it to make it work in the room. If you can’t find what you love “off the shelf” have it made! Pictures do tell a 1,000 words and taking pictures helped me see my mistakes. 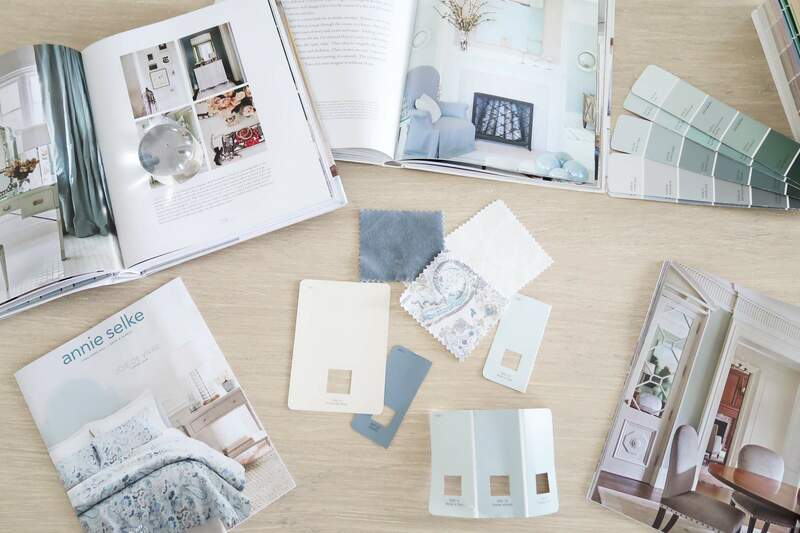 Time to get to the good stuff and why you are really here 🙂 Let’s see how it all turned out…and if I nailed the “little bit Modern French Country, little bit Paris Apartment” vibe that I was inspired to create. 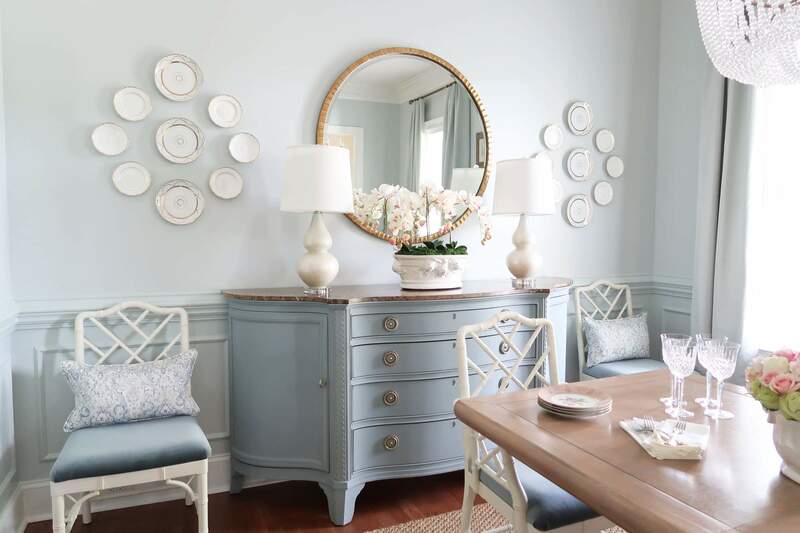 The design is very tone on tone in shades of blue, for a serene and calm feeling. 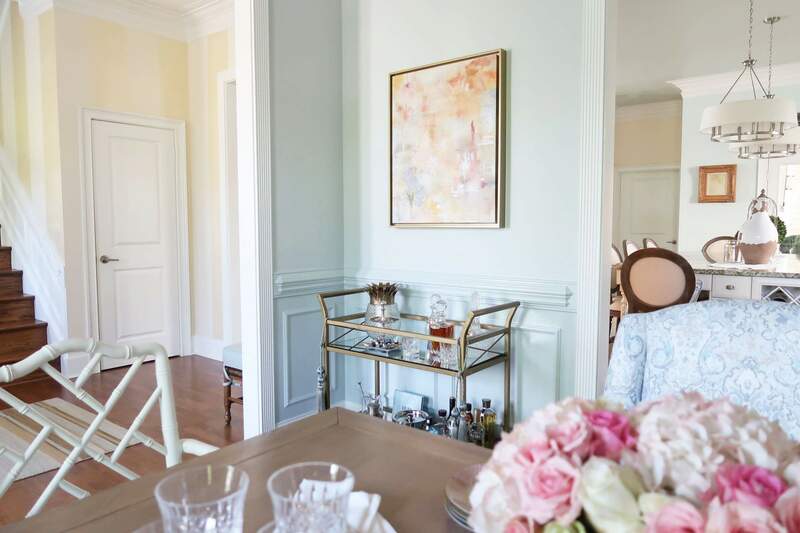 If you fall in love with something in this room and would like it for your own home, sources are listed throughout and at the BOTTOM of the post. Post contains affiliate marketing links, but all products were hand selected by me! If you buy through one of my links, I may make a small commission that helps support producing content and maintaining this website. Let’s start with the credenza because that was the ONE piece of furniture I kept in place and didn’t replace, but it got a MAJOR makeover. After being inspired by both Swedish and French painted furniture in shades of blue, I decided that this piece would embrace a similar look. Painting it with chalk paint was easy, but that first stroke of paint made me a little sick to my stomach. I’m SO happy with it turned out and now is the centerpiece of the room. 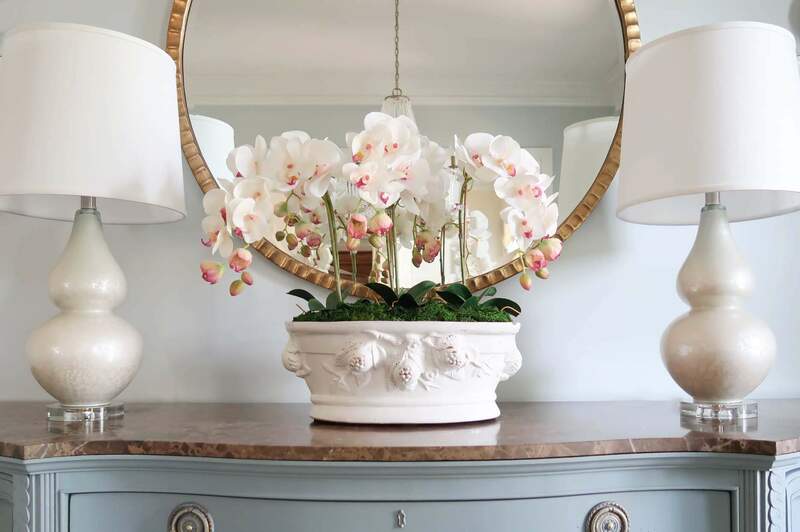 The most exciting piece that I LOVE even more than the credenza is the orchid arrangement! I’ve NEVER made a floral arrangement and was so happy with how it turned out – it’s the wow factor I needed on the credenza. After trying little pieces: framed artwork propped, books, Eiffel towers, orbs, etc. the orchids won by a LONG shot. The room needed a substantial decor accent piece with color at the end of the room. 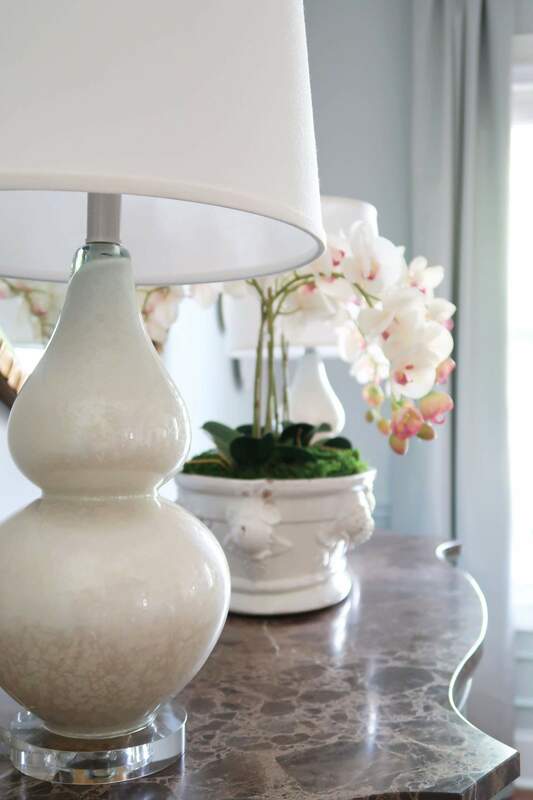 Next, are the most gorgeous pearl lamps that are très chic! The lamps offer a little different texture plus they complement all of the other finishes in the room. The acrylic base makes them look like they are floating and reflect the glass beads in the chandelier design. 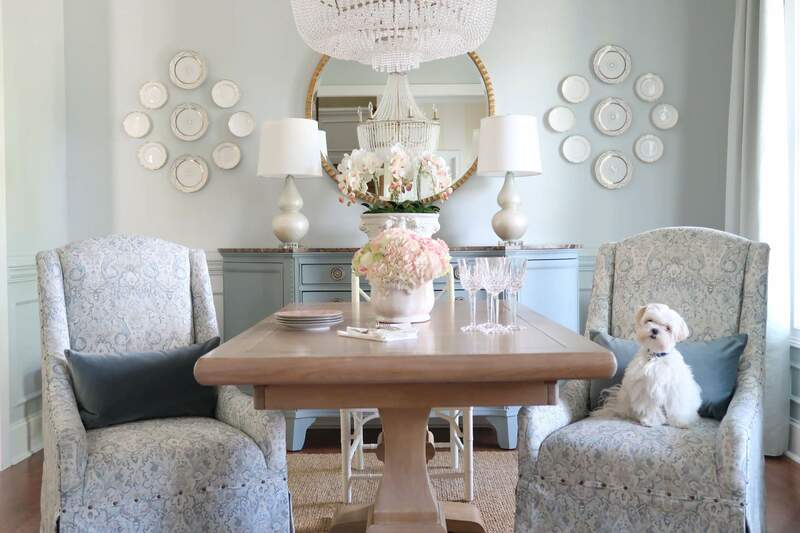 A necessity – the gorgeous new pedestal dining room table. 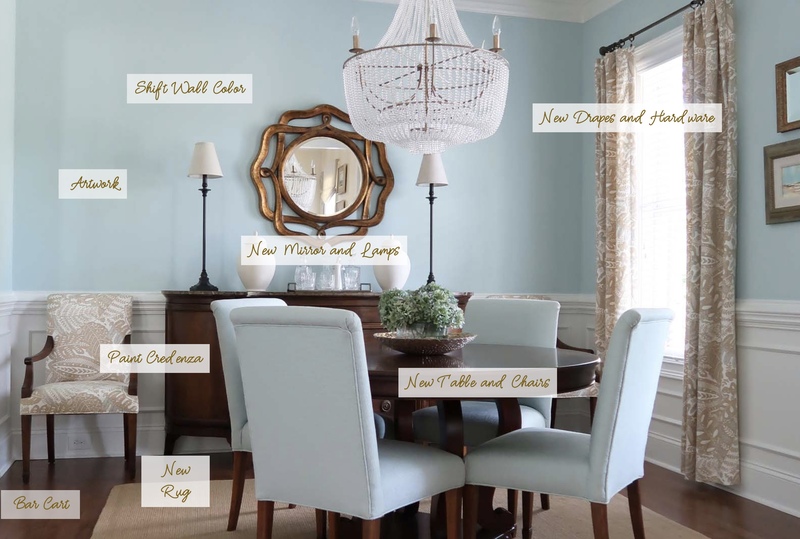 I can finally seat 8 people for dinner and as I stated from the beginning this makeover was about “setting the table for a bigger life!” When it first arrived, it had too much of a coastal “white wash” feel so I ended up antiquing it with light brown Briwax. The table is now warm and rich in tone against the rest of the cool colors in the room. The natural sisal rug is the perfect backdrop and seamlessly blends into the decor, which I found was very important to me! 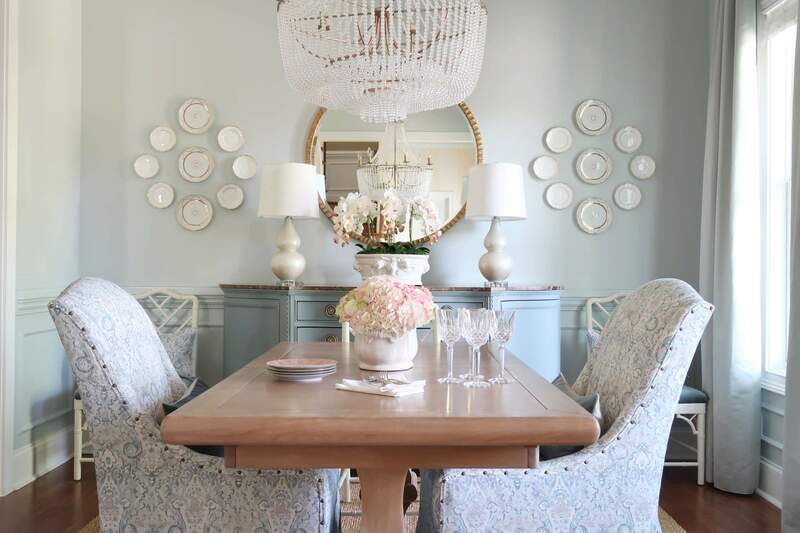 Yes, chinoiserie chic at it’s finest! Chinoiserie is a French term for “Chinese-esque” or “imitation of Chinese motifs”. A style turned popular in the 18th century. Europeans became fascinated by the Far East and bamboo furniture that came from the region. 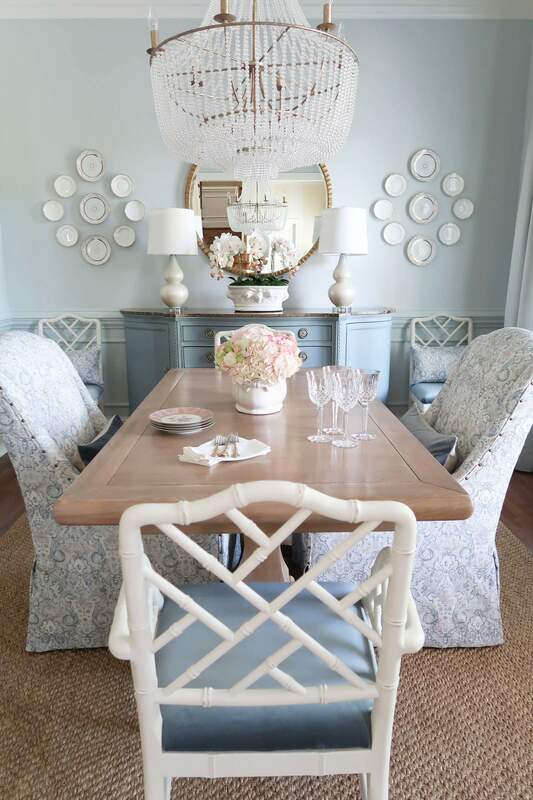 European and English craftsmen took the bamboo inspiration and interpreted into classic Chippendale chairs. I love how the open back let’s you see the gorgeous credenza versus being blocked by an upholstered chair. They originally were a neutral fabric and I recovered them in an Oasis Velvet for a more luxurious look. Oasis velvet lumbar pillows pick up the same fabric as on the Chinese Chippendale chairs to pull that color throughout the room. 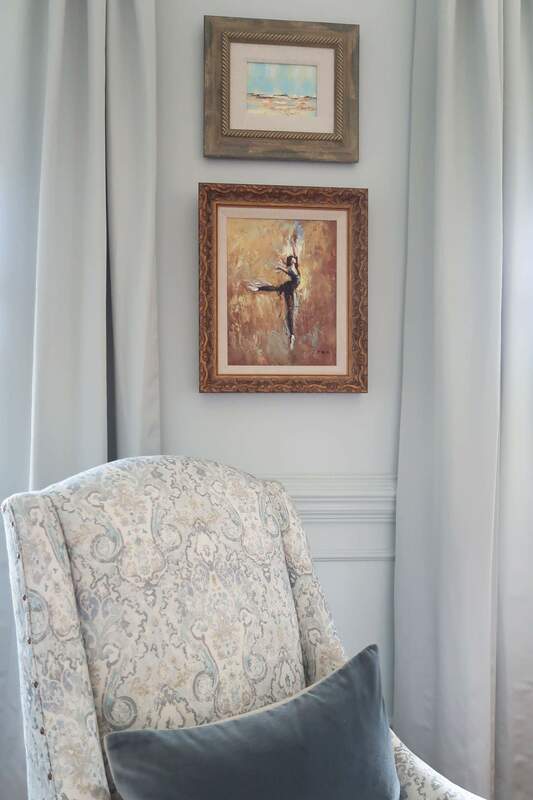 The “Dancer” painting is a long time love that I wanted to use because it is the visual of how I felt as a dancer performing on stage long ago. To me the drapes are a miracle! How I found a fabric, in the look I wanted, and an almost dead match to the wall color is surreal. Without time to approve a dye lot cut, I had to say a prayer they would be just as gorgeous as the sample. Luckily, they WOWED me! They are the perfect Paris apartment feel using a sumptuous satin fabric evoking a more sophisticated look. Because they were custom I was able to make them to hang at the correct height. The last set of drapes were a measuring mistake and sat on the window moulding, so now the drapery adds height to the room. The new gold drapery hardware is nice upgrade to what was there previously. This was the ONLY thing that went off without issue hmmmm. To say I needed partake in pouring from one of those decanters from time to time is no lie! So many do overs in this room will stress a woman out! Previously this corner was nothing to look at, with a plant that always died. It is a MUCH better use for this space and appropriate for a dining room. I love the gold and blue tassel detail adding a little French flair. The new abstract artwork pulls together not only colors in the room, but throughout the downstairs too! 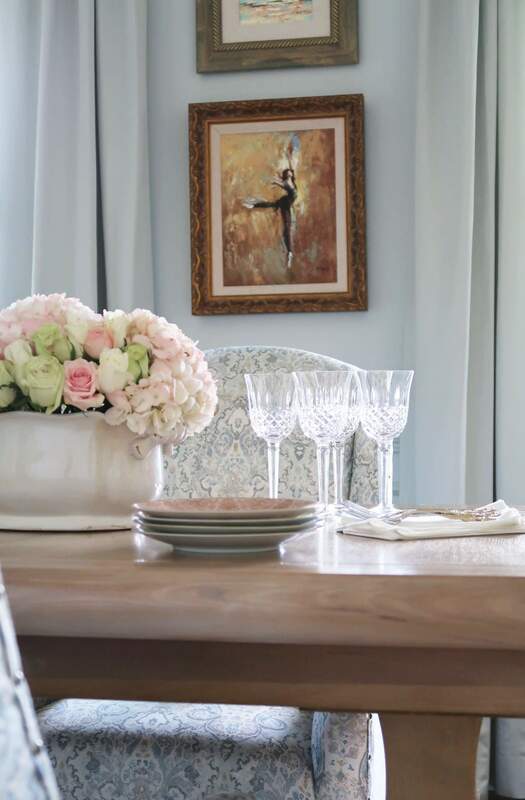 A little spray paint made the frame the “right” shade of gold not only for the room, but the artwork too. If you’ve followed this makeover from the beginning, you KNOW I’ve had a hard time finding artwork for the main wall. It’s all been a blessing in disguise and I LOVE the look and feel of the plates on the wall. What is really fun is that I can change them out seasonally to create a whole new look or even expand the layout. 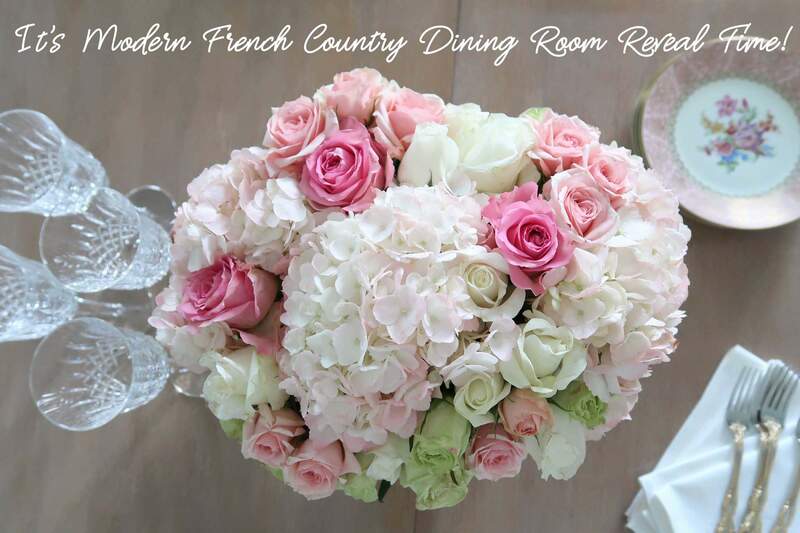 Do you feel a little bit French Country and a little bit Paris Apartment after walking through the room? 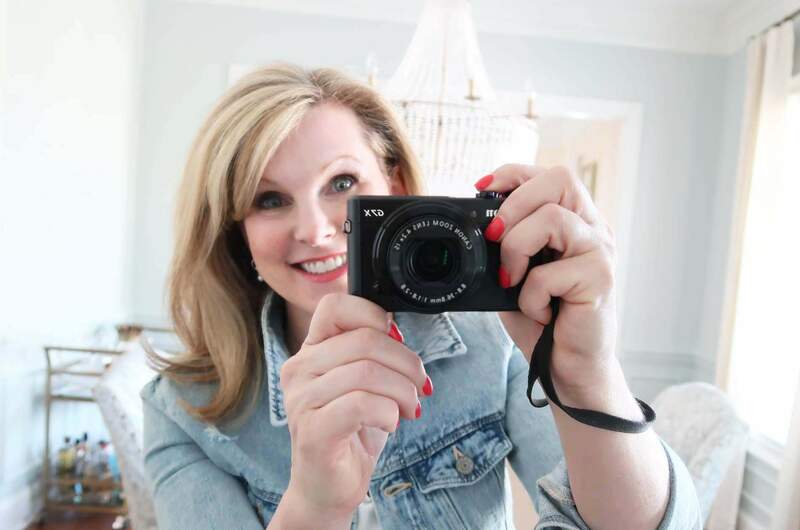 I hope you love the makeover as much as I do and feel inspired to tackle your own room in the Fall! Hmmm what space will be next at my house??? Thanks to my Mom for the many panicked “pick up the phone please” texts, “FaceTime me now” pleas, talks off the ledge during disasters, and her eagle eye! Thanks to Theresa for evaluating my reveal photo to make it perfect and to my friend George for moral and physical support installing 3 rugs! And to my SHs (you know who you are) for taking me out for wine and pre-birthday celebration, as a happy distraction this week! Also, what is SO fun about being part of the One Room Challenge is meeting other bloggers and designers who share the same passion. Thanks to perfect strangers and friends who commented in the middle of the night and cheered me on through Instagram and Facebook. I appreciated it so much – especially as things got tough! Have fun following along and please visit the 20 Featured Designers and the Guest Participants. Thanks to Calling it Home and Linda Weinstein for creating this fun event that motivates us to makeover our spaces in 6 short WEEKS! So you don’t miss a post, please consider signing up for my weekly email newsletter in the pop-up window! Once a week, I’ll send you an email with all the details and posts from the previous week. To follow along daily, I’ll be posting on Instagram and Facebook, so choose the social media platform that works for you. Off to rest and recover! I have a little getaway planned and can’t wait to celebrate the completion of this design project with those that I love. I kept looking at the before picture thinking how could you make this any better? But, wow, did you ever! It is beyond gorgeous. It is just amazing. Love that it isn’t cluttered as so many rooms are. Just beautiful. Claire, Thank you and that is SO sweet! I really appreciate it. It’s the prettiest room in my home now and I love it’s the first room you see when you walk in! Love this room,esp the stunning credenza…I too went to Paris this year,I am in love with all of it…My decor is French Cottage,I love chalk paint,valspar is great.I am a painting Queen,lots of gray and off white,Little black and aqua walls,with my bold pattern of black and off white buffalo plaid….I have a beautiful cherry cabinet that I want to paint…..you have inspired me to do it….Love the blue you chose,mine will need to be more aqua….Love your ambition and inspiration..I have been widowed for 28 years ,so I found the best t heraphy for me is my family,home and gardens…..
Tracey, this room is absolutely beautiful! It was gorgeous before but you really took it to another level. 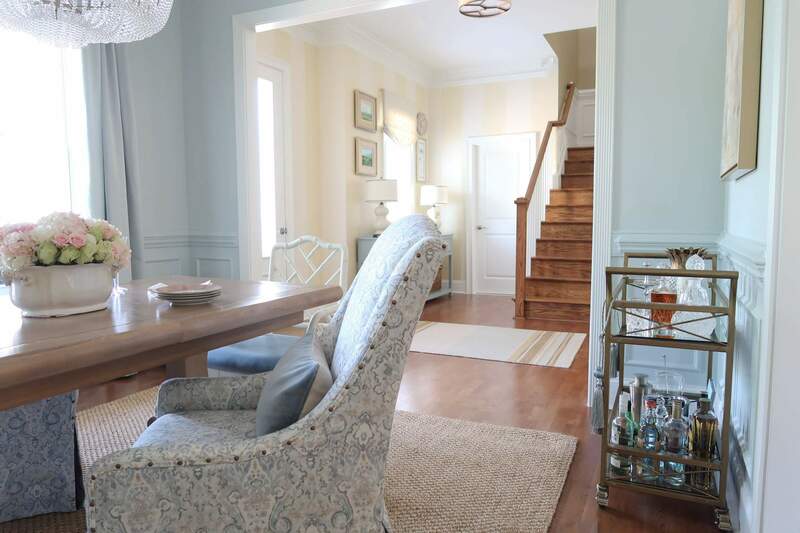 Love the chairs, the colors and the amazing job you did on that credenza! Congratulations on a successful ORC! Shelley, thank you! I appreciate you saying that because it was my hope to make it look softer, but more sophisticated 🙂 It was scary painting the credenza, but I am so glad I did. Tracey it is absolutely gorgeous!!!! Love what you did it is stunning!!! The room is beautiful! I was wondering what you did to the top of the buffet? Was the top replaced or is it a faux paint technique? Thank you! It’s crazy what color will do – it’s the same marble top, but looks so different with the paint color! It made it look more gray/brown. So lovely! I could move right in! Kristin, Thank you! It’s been a beautiful change. 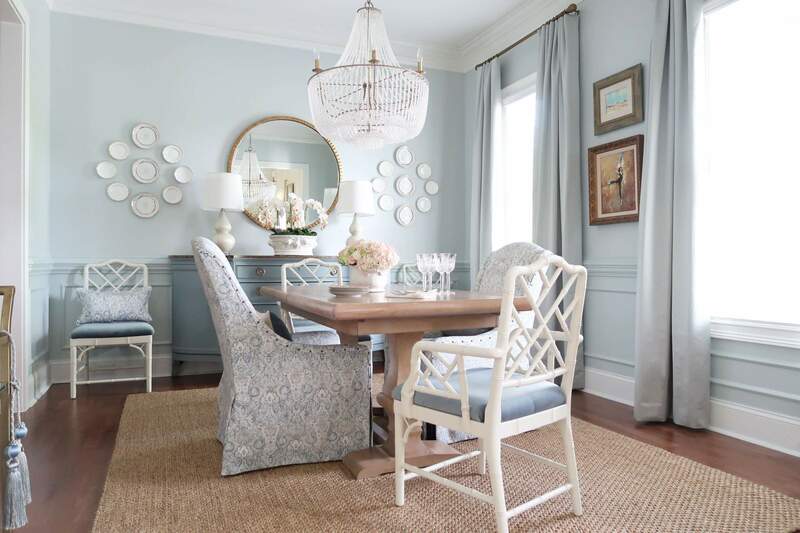 Wow Tracey, your dining room is so beautiful! 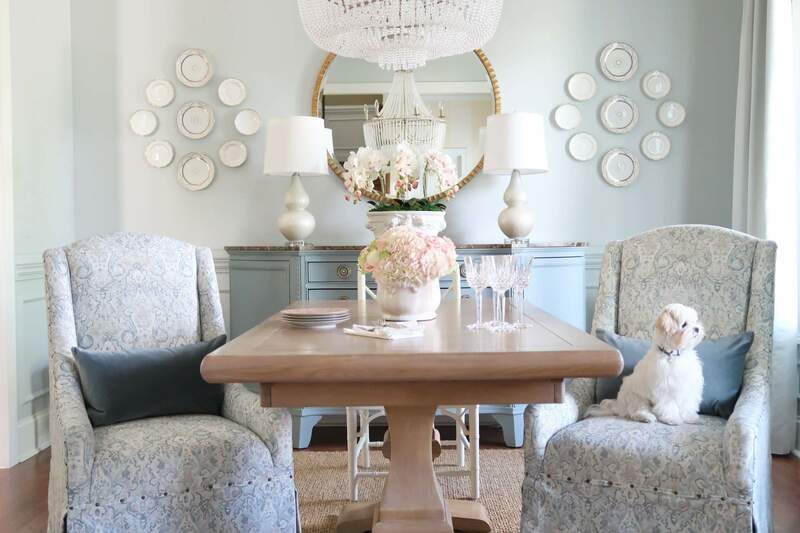 The credenza and chandelier are some of my favorite elements! The room looks beautiful, well done! The credenza looks amazing and it’s as if it was always meant to be that blue color, it’s really pretty! Colleen, oh that means A LOT. I was so nervous to paint the credenza, but it’s like it has a whole new life! 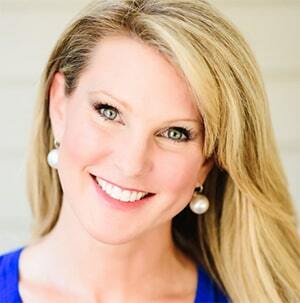 Wow Tracy…so beautiful! I love modern french country as well and you nailed it! 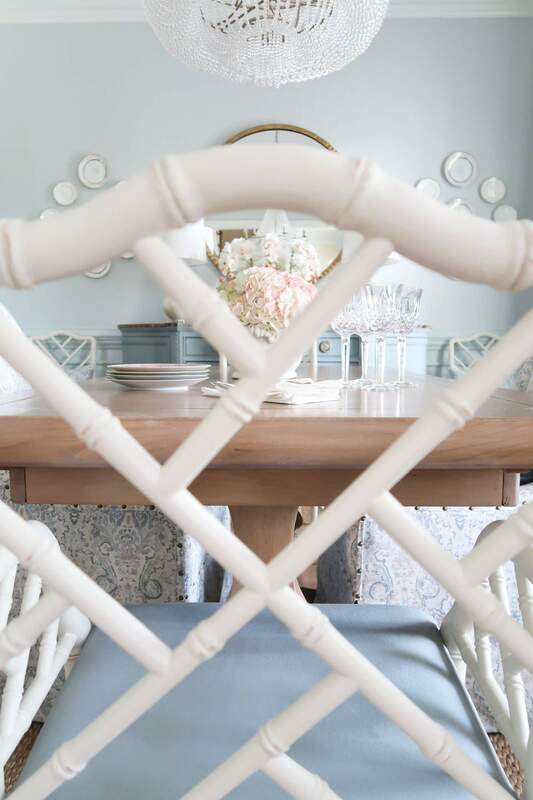 Love the light blue tones…fabulous! Denise, thank you! I seem to be a pale blue person – it just calms me at first sight 🙂 Your basement is stunning! Wow, Tracey!! 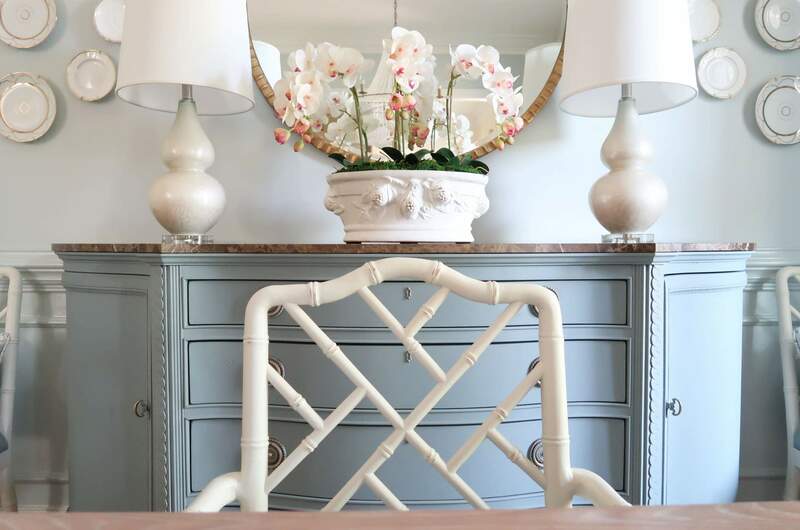 I am thoroughly impressed with this transformation and your DIY skills! You are so talented! The colors are so soft and beautiful. That chandelier!! It’s like diamonds hanging above the table. Love the chairs and the credenza too. Way to go! Stacey, I appreciate it! Yes, it was so odd that when I changed the wall color and the drapes match – it highlights the chandelier so it sparkles! The chalk painted credenza is amazing! What a beautiful room you created. I could hang out there with you for hours. 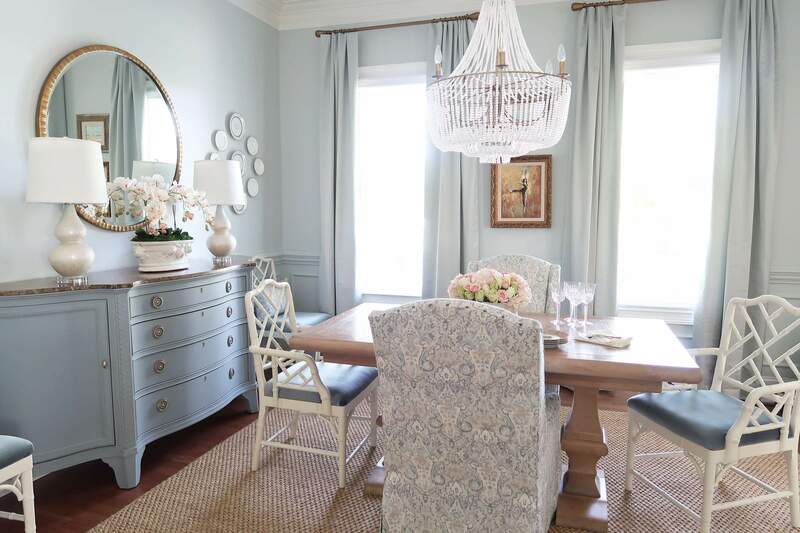 I knew I would love your dining room; let me count the ways: the painted credenza is divine; the drapes rich and luscious and the blue color is perfect; the lamps are stunning and the floral arrangement is so pretty. 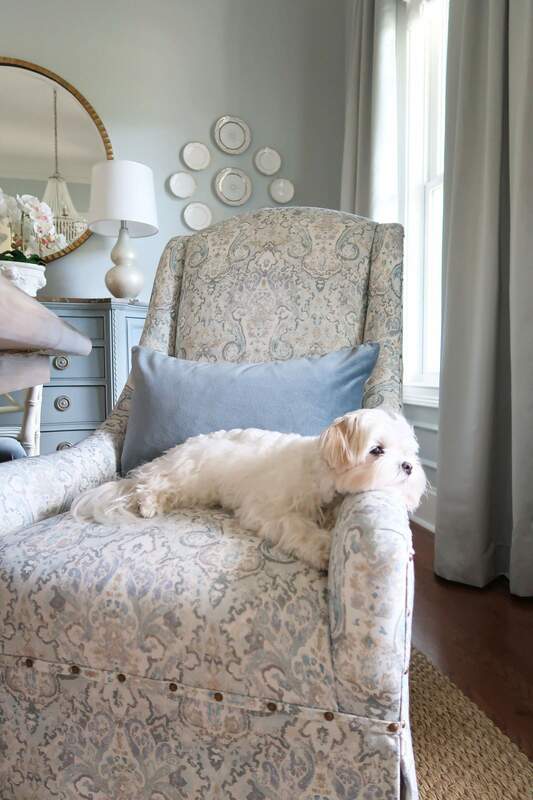 Love the fabric on the chairs. 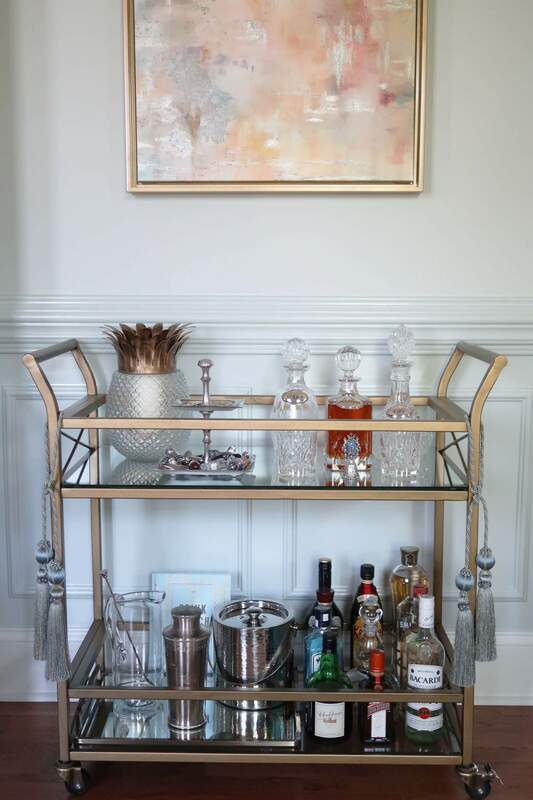 I’ve never met a bar cart I didn’t love and putting in that corner was brilliant. You weathered through girlfriend. Congratulations. Let’s have a glass of wine at Haven! Thanks, Carol! Can’t wait for Haven and cheers we made it!